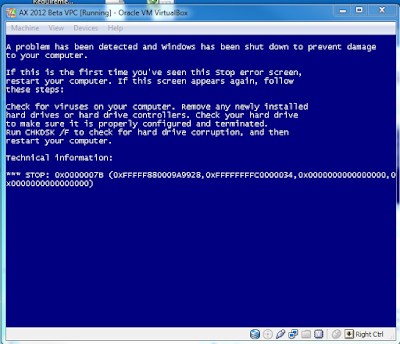 In order to run the AX 2012 Beta VPC, it usually requires HyperV, or attaching the disk locally. This is a great solution I was told about to run it locally. The basic idea is you just create a virtual machine, mount the three *.vhd's, and start it. This blog post highlights two important caveats that you will come across. This is the blue screen I kept hitting over and over...very frustrating before seeing this blog post for the solution. Sending emails from AX has been somewhat of a pain when it tries to use Outlook. This post is a simple code modification to one method in \Classes\Info\reportSendMail. I did not develop this code, I merely tweaked it. The original poster's blog has disappeared, and I can only find non-working remnants all around the web of this, but it is just too useful not to repost. If you have Outlook 64bit edition, you might get the "Either there is no default mail client or the current mail client cannot fulfill the messaging request. Please run Microsoft Outlook and set it as the default mail client." Followed by an AX MAPI error. Or sometimes you may get the "A program is trying to access e-mail address information stored in Outlook."...Allow/Deny/Hlep. This change basically bypasses outlook. Put it in and give it a shot.